The US State Department announced Wednesday that it would be imposing sanctions against Russia regarding the poisoning of Yulia and Sergei Skripal in the UK earlier this year. The department said that it determined Russia had used the nerve agent Novichok against the Skripals deliberately. Sanctions are expected to take effect on or around August 22. Responding to the US' announcement, a spokesperson from the British Foreign Office welcomed the move and stated that it sends "an unequivocal message to Russia that its provocative, reckless behavior will not go unchallenged." Prior to the announcement, the US had joined fellow European nations in blaming Russia for the incident; however, the Trump administration hadn't issued a formal statement on the matter. According to NBC News, the immediate repercussions will act as an add-on to previous sanctions limiting exports and financing. "The biggest impact from the initial sanctions is expected to come from a ban on granting licenses to export sensitive national security goods to Russia, which in the past have included items like electronic devices and components, along with test and calibration equipment for avionics," the outlet states. The sanctions could also suspend Aeroflot flights to the US and are certain to cool relations between the global powers, though a US State Department official noted after the announcement that Washington hoped to maintain relations with Moscow. The US wants assurances that Russia will not use chemical weapons and will allow inspections. The State Department, however, is waiving some other sanctions on Russia. "We are also waiving sanctions with respect to space flight activities because of course there are space flight actions in which we are engaged with the Russian Federation upon which we depend on some regards," the department official said in announcing the new sanctions. On March 14, days after the Skripals were found slumped on a park bench in Salisbury, England, UK Prime Minister Theresa May announced that she would be expelling 23 Russian diplomats from the country. May justified her decision by saying it was "highly likely" the mysterious poisoning had been carried out by Russia, in part because the substance used to poison the pair had been identified as novichok, a military-grade nerve agent developed in the Soviet Union. UK labs have not since been able to trace the origins of the specific substance that poisoned the Skripals, however. 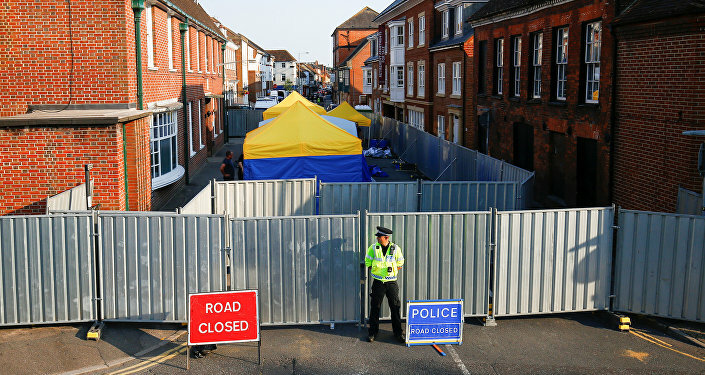 Months later, on June 30, two other people were found unconscious in the UK city of Amesbury, near Salisbury. According to UK officials, both Dawn Sturgess and Charlie Rowley were exposed to the same nerve agent that the Skripals had come into contact with. This, too, was blamed on Russia. Sturgess later died. Russia has adamantly denied that it played any role in either poisoning, stressing that the UK has failed to offer any solid evidence to back up their claims.